Home> Mobile> Games> iOS iOSAndroid> Trivia ActionAdventureArcadeBoardCardCasinoDiceEducationalFamilyKidsMusicPuzzleRacingRole PlayingSimulationSportsStrategyTriviaWord> Christmas Trivia - Are You Smarter Than Santa? 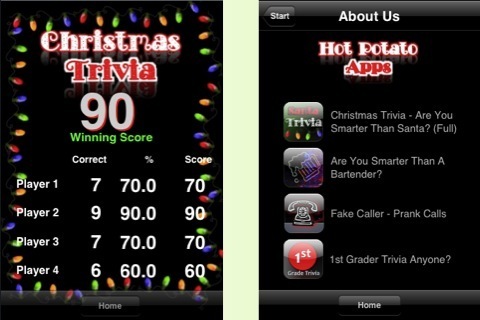 *** The Original Christmas Trivia Game on the App Store. *** Featured in the Holiday Apps Section. Ho Ho Ho...Christmas is coming, how exciting!!! We've assembled some fun Christmas trivia questions that you and your family will enjoy answering as you open those presents...and it's also a Christmas Countdown so you know exactly how days you have left to get ready!!! Discover which family member knows everything there is to know about Christmas and the holidays. Learn some Christmas facts from around the world as well. Santa Claus is coming to town....get ready to impress him with your Christmas Spirit. Christmas quiz questions are designed to be family friendly, the kids will love it. Get Christmas Trivia now at our introductory low price. There will be free updates with more and more questions leading up to Christmas.